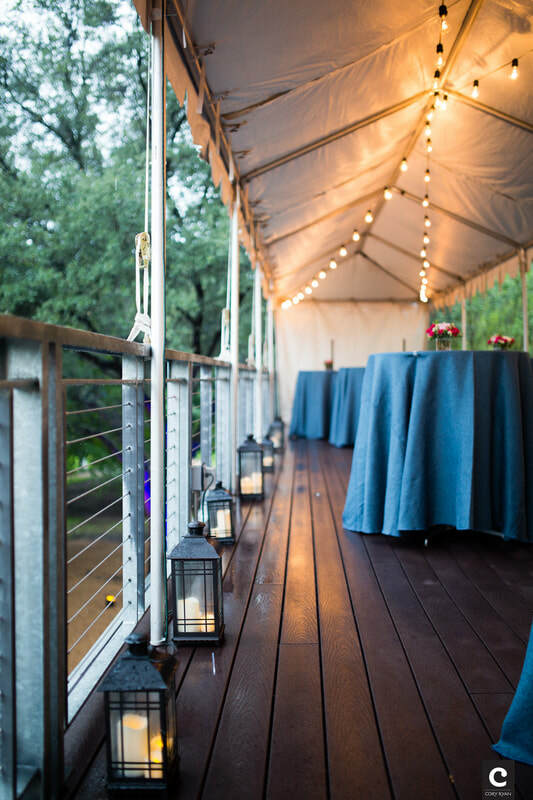 At the Waller Creek Boathouse, we've delivered turnkey events for everything from corporate seminars to evening socials and to SxSW experiences. No matter what your needs are, Waller Creek Boathouse has flexible options to create a memorable experience for attendees. 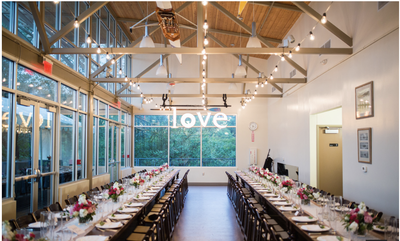 The upper level of the Boathouse has 1,900 square feet of indoor and outdoor rental space. This includes the Lakeview Room and patio, with the option of including the Café space. 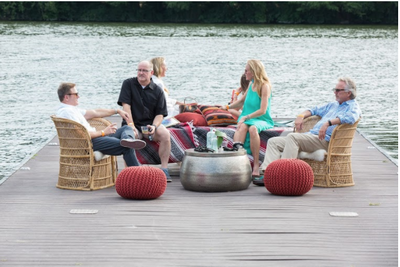 The downstairs level offers a spacious 2,700 square feet of outdoor space which includes the flagstone terrace, docks and Congress Lawn. There are indoor and outdoor restrooms are available, and the building is wheelchair accessible. The Upstairs level of the facility is available Monday through Sunday with a minimum rental time of 6 hours. The Downstairs level of the facility is available Friday through Sunday after 2 p.m. and has a minimum rental time of 8 hours. Facility buyouts are negotiated on a case-by-case basis. Venue rentals are subject to availability and may change upon Boathouse vendor programming. Upstairs Rental Space (includes Lakeview Room and adjoining patio, Alta's Cafe space optional). Downstairs Rental Space (includes space within blue boundary line). Pricing is based on the number of hours the facility is needed, including set-up, event, and breakdown times. A venue rental security deposit is required and will be refunded within a timely manner after the event is concluded. Accepted forms of payment include check, money order, Visa, and MasterCard. Waller Creek Boathouse event personnel are on site for the duration of the event. Audio visual equipment and furniture rentals are not included in your venue rental. Boathouse staff can make arrangements at clients request. Events having outside music playing past 8 p.m. on weeknights and 10 p.m. on weekends, are subject to obtaining a City Of Austin sound permit. Facility buyouts are negotiated on a case-by-case basis and can be customized to your needs. Buyouts are available during all premium event times in the Austin area. Premium events include but are not limited to: SXSW, X-Games, Formula 1, ACL, and Republic of Texas Biker Rally. Reservations must be made no less than 14 days in advance of the event date. 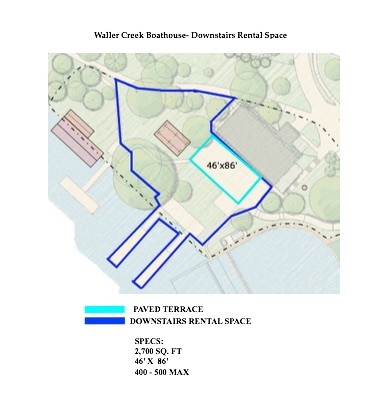 ​Waller Creek Boathouse buyouts do not automatically include the Alta’s Café interior or outdoor space. Should you wish to reserve the café’s interior and patio space, please inquire with the Alta’s Café events team for a specific quote. Reservations must be made no less than 14 days in advance of the event date. 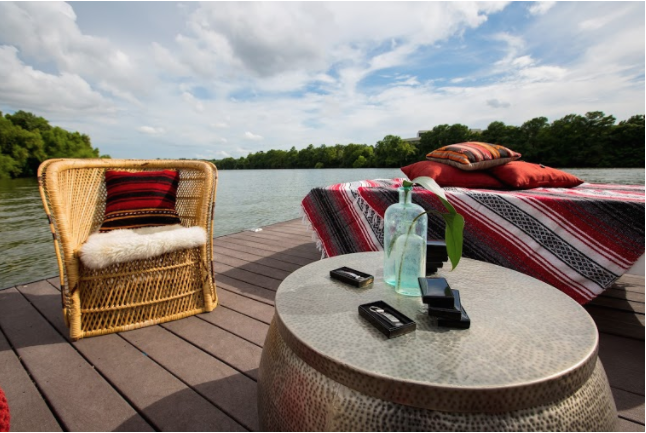 Waller Creek Boathouse has a preferred list of vendors to choose from. 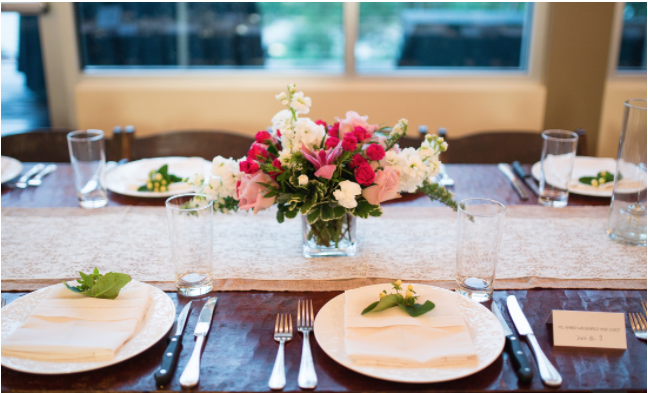 However, clients are welcome to use caterers of their choice for the food menu, assuming the vendor provides all necessary catering and health permits. Tents positioned on the upstairs deck cannot exceed 600 sq. ft.
A minimum of a 12 foot separation shall be required between each tent that exceeds 700 sq. ft.
Tents should be adequately roped, braced and anchored to withstand the elements of weather and prevent collapse. All tents must be secured with water barrels. No staking of tents is allowed on the premises. Tents exceeding 700 sq.ft. that has sides must have exits signs. Exit signs shall be installed at each door to direct public to the exit when the tent serves more than 50 people. Tents and all sidewalls and combustible materials must have a certificate showing that they meet the performance criteria of NFPA 701. No open flame devices or other heating or cooking devices are allowed. Austin Rowing Club would continue to operate during their normal programming hours unless prior arrangements have been made between WCB and Client. ​Alta’s Café would continue to operate during their normal business hours unless prior arrangements have been made between Café and Client. Rō Fitness, our in house rowing studio class, would continue to operate during their normal business hours unless prior arrangements have been made between WCB and Client. Congress Avenue Kayaks, our in-house kayak vendor is housed downstairs and would continue to operate during their normal business hours unless prior arrangements have been made between CAK and Client. For inquiries regarding kayak/SUP rentals, please contact info@congresskayaks.com. ​Reservations must be made no less than 30 days in advance of event date. Please note all rentals are subject to availability and may change upon Boathouse vendor programming. A signed Boathouse rental agreement and deposit of one-half of agreement total is required to secure dates and space. The remaining balance amount is due 30 days prior to the event date. To inquire about event rental and to set up a site visit, please visit our or leave a voicemail at 512-831-4922.